The Statue of Liberty has been glorified, romanticized, trivialized, and over-publicized. But the meaning of “Liberty Enlightening the World” is still everything. 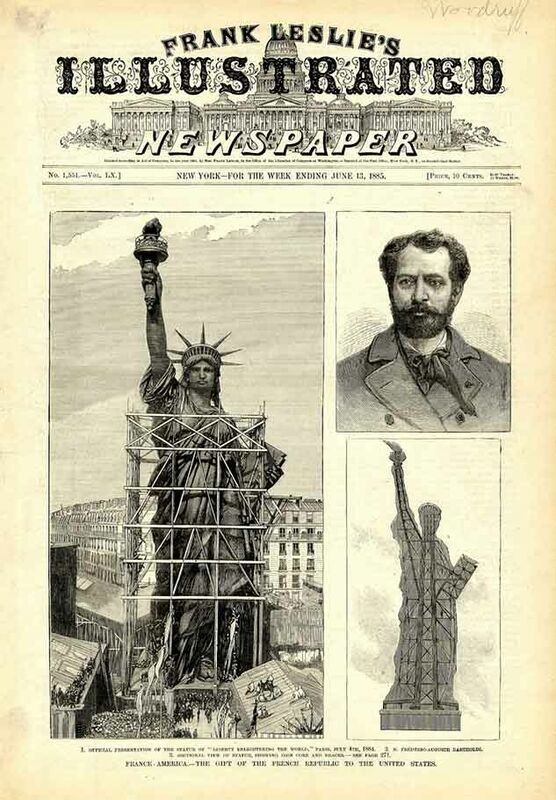 It took Bartholdi twenty years to design and create his monumental sculpture "Liberty Enlightening the World" to honor the ideals that America embodied, widely admired by Europeans ruled by monarchies at the time. To withstand the pressures of winds and changing temperatures, he constructed the statue with flexible copper sheets hung over an ingenious iron framework designed by engineer Gustave Eiffel. At the time of completion, the statue was not just the largest ever built but the tallest structure of its kind in the world. And the vital statistics still seem fabulous. From its toe to the tip of its upheld torch, the statue is 151 feet tall. Counting the pedestal, it rises 305 feet above the tide. Its head measures 10 feet from ear to ear, its nose a good 4 feet in length. It weighs 450,000 pounds, or 225 tons, its sheathing of hammered copper accounting for nearly half of that. Inside, the route from the top of the pedestal to eye level is a steep climb of 154 steps, the same as a twelve-story building. The fact that it stands where it does, taking the winds of New York Harbor full force in all seasons, is testimony to an internal design far more ingenious and important as a feat of structural engineering than most people are aware. Rising more than 300 feet above New York harbor, the Statue was the tallest structure of its kind in the world when it was built in 1886. Yet all that hardly explains how we feel about it, our Miss Liberty or “Liberty Enlightening the World,” as once it was known. For all the statistics, the publicity, for all we think we know about the statue, it remains an extremely elusive subject with many sides and a fascinating history. Click here to see a slideshow of historical posters, political cartoons, and parodies of the Statue of Liberty. 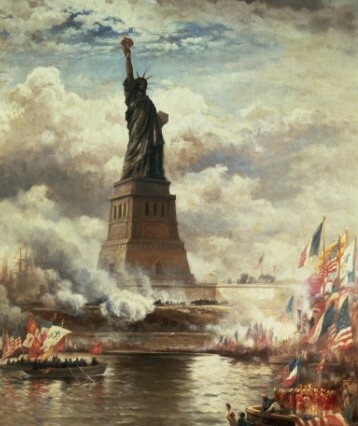 Thomas Moran created a dramatic painting of the dedication ceremonies for Liberty Enlightening the World in 1886. In Washington, at the center of Pierre Charles L’Enfant’s mall before the Capitol, the Washington Monument was at last completed (in 1884), the loftiest, solid-masonry tower ever built. With the colossus in New York Harbor, the nation had two monuments comparable to those of ancient times. For Bartholdi, for the workers in the shops of Gaget and Gauthier in Paris who first built, then dismantled and packed the statue for shipment, for Gustave Eiffel, the versatile French engineer who devised its iron skeleton, and for the many thousands of French citizens of all walks who contributed the money to pay for this greatest-ever-gift to the United States, it was both a way of showing French regard for our noble founding principles and helping the French recover their self-esteem after the debacle of the Franco-Prussian War. Vaunted France, the France of Victor Hugo and Louis Pasteur and Ferdinand de Lesseps, the France of Emperor Napoleon III, and what, by reputation, was the most formidable army in Europe, had been crushed by the Germans like an overripe melon. The response of the French people afterward, however, was stunning. They would show that France was France again in “dazzling form,” not on the field of battle but in the arts and sciences and with monumental works of peace and progress. Bartholdi himself felt the humiliation of the late war to the depths of his being. He had served in it; he had seen his native Alsace ceded to Bismarck’s new Germany. But it is not simply that the statue, the product of that impulse and that age, stands on or beside the harbor. She is in it, she is of it - on little Bedloe’s Island, the site of an old fort and, at odd times, a pest-house and a gallows. She is surrounded by salt water, by an arm of the Atlantic, which has much to do with how we feel about her. She is, thus, ever in the midst of passage for all who come and go - alone, unrivaled, her beacon torch visible for miles. She is like the light left on at home when you go out at night. For all of us who were born here and who have gone away and returned from our travels and from two wars, she has meant just that – “Home, I’m home. This is my place. I didn’t take the wrong boat.” Coming and going by plane, as we do now, we still pick her out below. “There’s the Statue of Liberty! Down there!” you hear people saying with excitement. 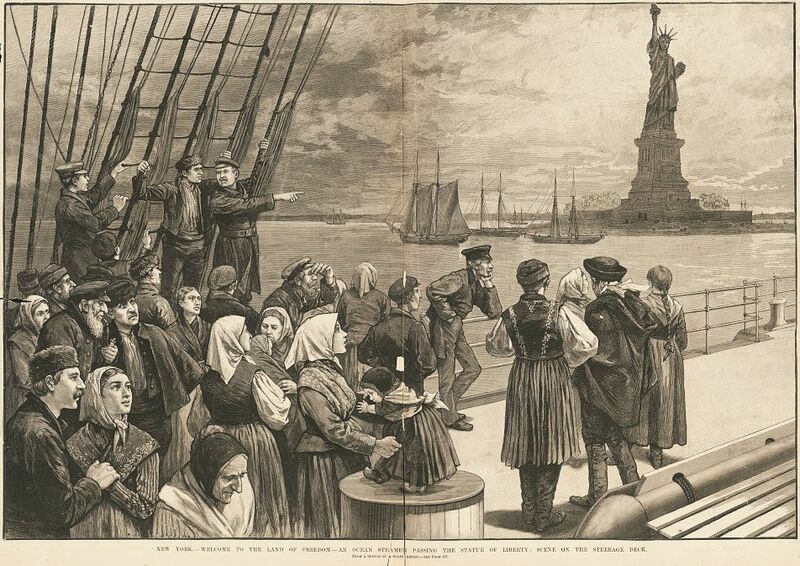 In the 40 years after the Statue was dedicated, an estimated 14 million immigrants arrived in New York. The Statue's uplifted torch came to mean "welcome" rather that "enlightenment," as her creators originally intended. From Frank Leslie’s Illustrated Newspaper, July 2, 1887. Library of Congress. For those of us who came from abroad in such overwhelming numbers, year upon year, when Ellis Island was the point of debarkation, she meant welcome to a new home. She marked the threshold. “From her beacon-hand/ Glows worldwide welcome,” wrote Emma Lazarus in her poem. In no country other than our own has so much American history transpired as in France and in the twentieth century especially, with its terrible world wars. There are 60,000 American soldiers buried in France, at places with names that are as much a part of our history as are Yorktown or Antietam. For the living who came home, Bartholdi’s statue had a meaning he never anticipated and that most of us now can only imagine. American Heritage recently reissued its definitive book on the Statue of Liberty in ebook and paperback. 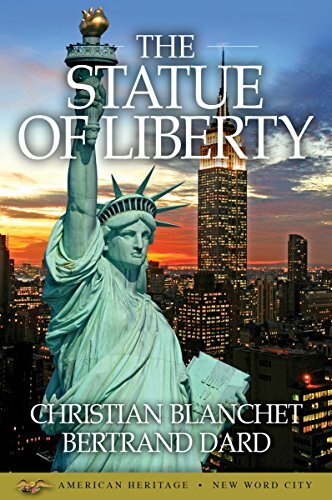 Edited by historian Bernie Weisberger, the book contained much new research uncovered in French archives about the statue's origins. But what of those others in such different times? Can we ever know what they felt? Others of us came to the experience from our own hinterland. Paul Horgan, the distinguished author and historian, remembered as a small boy traveling down from upstate New York with his father, who took him to see the statue because “he was trying to make an American of me.” How much is contained in that deceptively simple recollection. And the process continues, with no limit on one’s age or sophistication or relative familiarity with U.S. institutions, “I become an American all over again when I see the statue,” remarked Daniel J. Boorstin, the former Librarian of Congress, who grew up in Oklahoma. The statue has been glorified, romanticized, trivialized, and over-publicized for purposes that often have little or nothing to do with its intended meaning. Like its near neighbor and contemporary, the Brooklyn Bridge, it has been stitched on pillows, embossed on silver spoons, printed on dinner plates, bandanas, T-shirts, and cocktail napkins. You can buy it in the form of a rubber stamp. And in ersatz bronze, with or without thermometer, it remains the all-time perfect cheap souvenir of New York - the Empire State Building its only rival. Its image has been enlisted to sell war bonds, biscuits, horsehair brushes, life insurance, credit cards, mineral oil, champagne, cheese, cigarettes, and sewing machines. It has been cartooned and lampooned without end. Today, it is praised and celebrated and photographed as it has not since the damp day in October 1886 when Bartholdi, a marvel in full dress, climbed to its crown to cut loose its veil with his own hand. Like all great events in history, it needs to be seen in the context of its times, of politics and technology and such largely forgotten and fascinating influences as those of the Freemasons. Like all great achievements in history, it is to a large extent the way it is because a particular group of people were the way they were. It is, among other things, a monument to several glory-struck, gloriously outsized egos of a kind only the nineteenth century could produce, sculptor Bartholdi being the prime example. He is the sort of character Jules Verne might have invented. Imagine discussing with a few friends, over dinner one evening at a country home near Paris, that you want to commemorate America’s democracy in some way, a fairly vague discussion that will one day result in the creation of the greatest statue on earth, a structure taller than any ever attempted before, in a distant land where you have never set foot and know no one, and then pursuing that vision with boundless persistence and enthusiasm for the next twenty years. Besides Bartholdi is Edouard de Laboulaye, French professor of law and author of a three-volume history of the United States, who was host that evening near Paris and a participant in the discussion of plans to create a monument celebrating liberty; and Eiffel, who ranks with such giants of heroic nineteenth-century engineering as Brunei and the Roeblings and whose subsequent triumph, the Eiffel Tower, would become for Paris what the Washington Monument is for our capital. A young boy points out the Statue to his immigrant parents from Ellis Island. The Americans include President Grover Cleveland; the brilliant Richard Morris Hunt, the first American trained at the Ecole des Beaux-Arts, architect to the Vanderbilts and Astors and designer of the statue’s pedestal; and Joseph Pulitzer, a Hungarian immigrant, the strange, ambitious publisher of the New York World who with the power of his paper raised $ 100,000 to pay for the pedestal. The statue is still there, unrivaled at the gateway. She isn’t a warrior. She isn’t bombastic or threatening. She isn’t a symbol of power. The Statue of Liberty is an act of faith.